SAP is already well known as one of the largest vendors of enterprise resource planning (ERP) solution having 12 million users all over the world. This German-based European multinational software corporation enabling its customers to run their business processes, including accounting, sales, production, human resources, and finance in an integrated environment. This enterprise solution ensures that any organization using SAP has information flows from one SAP component to another without any data redundancy. It also helps organizations to enforce financial, process and legal controls facilitating the effective use of resources, including manpower, machines and production capacities. Many SAP customers have been running SAP on-premise for decades and have been hesitating to harness the benefits of the public cloud. But as the public cloud has transformed IT and businesses, on-premise hosting has become harder to justify on this cloud-based era. While the long-established benefits of the cloud technology like- superior scalability and lower costs have only become more apparent as the technology has matured, SAP on public cloud has also overtaken on-premise hosting in areas like security, historically used to justify staying on site. Resource pooling has drastically cut the costs of public cloud operation. This term includes data storage services, processing services and bandwidth provided services. Other related terms include rapid elasticity, which also involves the dynamic provisioning of services, and on-demand self-service, where customers could change their levels of service without actually contacting a service provider. By operating at hyper scale, public cloud providers can keep the cost of computing low, passing the savings on to tenants. SAP on-premise to cloud migration also moves your business from large CapEx (capital expenditure) on hardware updates to stable OpEx (operational expenditure), where you only have to pay for the cloud computing you actually use. SAP on public cloud can give your organizational activities more agility and flexibility. Your on-premise servers limit the resources that you have installed. On the other hand, unforeseen growth in resource demand can impact on your whole performance of the system. Where SAP on public cloud, there’s no need to plan hardware upgrades to meet your growing demand, you can provision resources instantly. SAP on public cloud also incorporates built-in life-cycle activities like system copy and snapshot which also improves the agility of your business. Your SAP on public cloud allows you to meter and automate your resource usage to maximize efficiency. Resources can be spun up during times of high demand, then turned off again to control spend and reduce waste. So, you can experience a real-time increase in the efficiency level of your user, hardware and overall process. As all these three pillars are interconnected. If one fails, no doubt you’re efficiency plummets like a brick in an Olympic swimming pool. Moving SAP to cloud gives your business the privilege to access unlimited resources virtually, with multiple data centers available in each region. SAP on public cloud take into account- database sizes, downtime requirements, and interface complexity to scale up with your business demand. This allows you to size the systems for their current workloads and add to scale the capacity as it is needed for new demands such as IoT projects, or business needs like mergers or moving into new markets etc. On cloud, abstraction converts the physical assets your landscape relies on to digital processes. Your SAP landscape on cloud computing process is no longer dependent on one particular set of hardware systems, which have to be carefully monitored and tuned to ensure proper system functioning. Additionally, running SAP on public cloud enables your business to benefit from a Software Defined Everything (SDE) environment. This provides a foundation for interpretation and automation of all cloud services, makes your landscape more robust and significantly reduces the cost of maintenance. The cloud greatly improves disaster recovery, availability and business continuity. On cloud, your SAP achieves the ability to spring back into previous condition during any mishap. With replicated storage, and the ability to harness multiple network providers, your business can avoid the risks that come with running your SAP landscape out of a single private data center. High availability is built-in on cloud, and users can meet arbitrary resiliency requirements at a much lower cost. SAP on-premise hosting can be very secure if done properly. On the other hand, very few companies have the resources to maintain the SAP on-premise hosting. The modern public cloud is designed around security, with extensive network hardening and testing, standard encryption and built-in access control. Third-party security certification and support for a wide range of compliance regimes greatly reduce the risks of breaches and data theft. So your SAP on public cloud is completely secured. Migration on cloud has been always a complex process. Your migration approach should address short-term aims, like decreasing hosting costs, as well as longer-term goals like better alignment between IT and business objectives. There are three kinds of migrational strategy available depending on your business goals. In this article, we are just giving you a basic idea of these strategies. Homogeneous “Lift-and-Shift” Migration: In this process, your migration looks like lifting an application or landscape out of its current hosting environment and shifting it to another environment. Lift-and-shift migrations transport an exact copy of the top three layers: application, database and OS layer. This strategy increases agility, simplifying future transformation. This migration makes it a good first step for businesses with a conservative culture, or indecision about long-term cloud strategy. There is another term that is really related to this strategy, this is called re-platforming strategy. Replatforming empowers your businesses to accomplish important goals beyond rehosting without greatly expanding the scope of the project. Technical Migration: Unlike “lift & shift” migration strategy, technical migration preserves existing applications while upgrades the OS and DB to meet certain transformational goals. In this cloud migration strategy, this is often done in part to harness cloud-native features such as scalability or automation. A technical migration can also prepare your organization for a future application migration. This facilitates your organization to minimize disruption and gain experience in the cloud, which you can use to plan the next stage of your transformation. Application Migration: In an application migration process, the application layer is transformed, along with the OS and DB. There are three basic strategies for application migration. Choosing a migration strategy is easy where designing and implementing is the challenge. Many upgrades and migration projects run into delays, cost overruns and other problems that can reduce ROI, or even disrupt your IT strategy. Brain Station 23 provides both SAP on public cloud hosting along with migration services platform which provides our SAP customers with a proven, cost-effective path to the cloud, accelerating migration by 70% — and eliminating the risks of cloud migration. 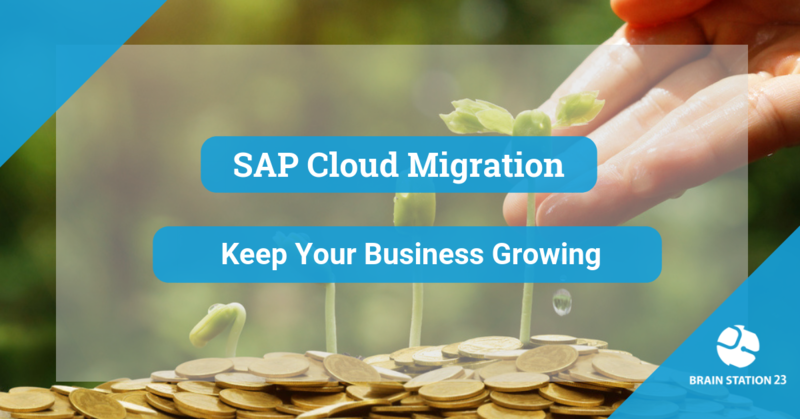 Ping us anytime to learn how we plan and execute successful cloud migrations for SAP or contact us for consultancy on migration assessment report for your landscape.